I have had a day. I am stressed, feeling hassles, and I really feel like I could just go to bed and put the covers over my head. I took my daughter to a new doctor today and we had to wait for over 2 hours just to get in to a room. With a one year old. In a tiny waiting room. With a glass door to the outside that he kept running to. With people wanting to touch him, and feed him weird things. By the time we got in there, and were told it was just to see a nurse practitioner I almost blew my stack. 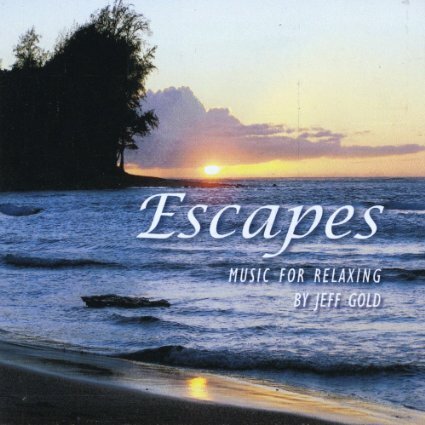 Days like this are days that I am really glad that I was asked to review this cd by Jeff Gold called, Escapes. I cannot even begin to tell you how quickly I wanted to get home and just take a bit of time to listen to this CD so I could relax and not have to hold all of the stress in anymore. I have a difficult time letting go of things sometimes and it is music like this that just takes me away to another place for a while so I don’t have to think. Yesterday I went to the dentist for myself and was told I needed to have a tooth pulled, UGH! Nobody ever wants to hear that, and I always get so nervous at the dentist. The dentist asked me to bring in a CD or mp3 player and they can hook it up so it plays in the chair while they are working. I bet you can guess that Escapes by Jeff Gold is going with me. I love how this is music too, some other relaxation music CD’s aren’t music at all but are noises and sounds, like rain or streams some even lightning. Escapes is just great music that kind of glides you away taking all of your stress with it. If you love to relax or better yet need to relax the days away this is the music to do it by. I have not met anyone that did not just love it. Previous post: Bil-Jac Dog Food, Made my dog want to eat again!